Are cold floors making it uncomfortable on your feet? When the floor over your garage, balcony, or porch is inadequately sealed, air can leak through various locations, like the structural framing, knee walls, and band joists. With air leaks present, many problems can arise; freezing pipes, chilled duct runs that prevent the HVAC system from functioning properly, and of course cold floors. 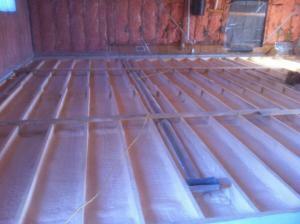 Air sealing the floor cavity efficiently is key in deterring air leaks. 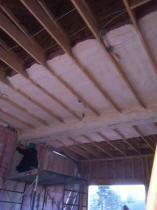 Eco Insulation® will apply spray foam at the band joist area and the subfloor as well as any penetrations in the floor, allowing for complete air and vapour sealing. A floor cavity that is sealed improperly has a considerably reduced R-value and is basically comparable to a floor cavity that has no insulation at all. For a superior seal that will last, consider having your exposed floors insulated with Spray Foam Insulation. Spray foam insulation expands to fill the tiniest and most awkward spaces and adheres to the floor above. Eco Insulation® provides Spray Foam Insulation to floors over porches, garages, crawl spaces and cantilevers; no longer will you have to experience the feeling of cold and damp floors throughout your home. Keep in mind that using fiberglass insulation under your floors can lead to several problems. Batts normally drop a few inches, which creates an air gap and invites moisture in. Any moisture that penetrates into your floor will cause damage to the wood, and creates an attractive environment for termites and rodents. Our Spray Foam Insulation will create a barrier between the ground’s moisture and your wood floors, preventing moisture and the potential for rotting to take place. Vinyl, carpet, cork, and wood are warmer on your feet than ceramic tile, stone, and concrete. Turn that old porch into a living space!